Continuing the Mali-to-Taos Invasion of 2013, Roots + Wires is bringing another exciting show to Taos this Wednesday in the form of Tinariwen, Touareg nomads from Sahara Desert. Taos audiences are likely to remember Tinariwen from their last visit to Taos in 2009, but there’s extra-good news this time around: Ibrahim Ag Alhabib, the group’s founder who was unable to be here last time, is definitely on the tour (additional confirmation of this detail came hot off the email presses just moments ago). The Tinariwen show is the third and final installment of Roots + Wires’ extremely successful 2013 African Music Showcase, beginning with Oliver Mtukudzi at KTAOS and recently followed by Fatuomata Diawara at Old Martina’s Hall (check out the LiveTaos Fatuomata piece for more background on this showcase). Getting Tinariwen to return to Taos is a testament to both the ever-growing reputation of Roots + Wires (headed up by Jerry Schwartz and the aformentioned John Henderson) and the enthusiasm of Taos audiences. The band has really blown up since their last trip to Taos — they’ve been everywhere from the World Cup in 2010, to the Colbert Report in 2011, to Coachella just this past weekend. 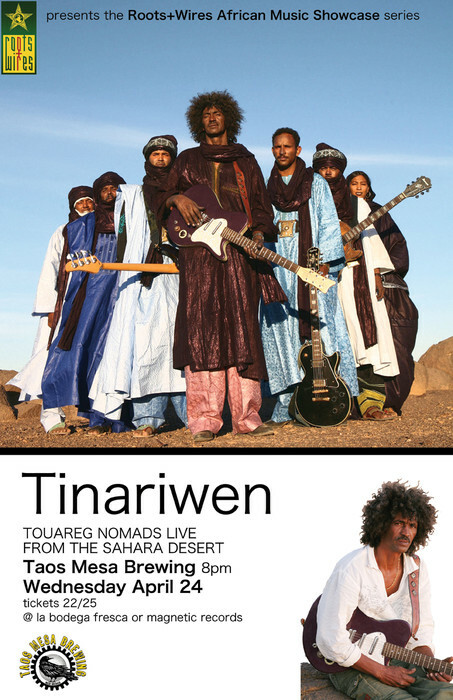 Nonetheless, Tinariwen reportedly enjoyed their trip to Taos immensely, and so our very own Taos Mesa Brewing Company made it onto their tour schedule (alongside much loftier and better-known venues). 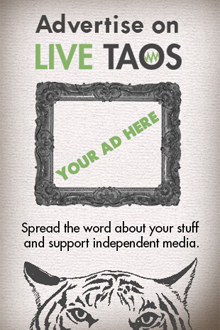 “Taos is known for art, and literature, and other things – we’ve worked very hard to try to make it be known as a place for live music, for the artists and for the audience,” adds John. We here at LiveTaos couldn’t support this mission more fervently — and, if this showcase has been any indication, Roots + Wires is paving an excellent path for the rest of us to follow. Word on the street is that this show is sure to sell out. For now, there are still tickets available — but they’re going fast. Drop by Magnetic Music or La Bodega Fresca today to grab yours before they’re gone. The next Roots + Wires show will be Friday, May 3 at Taos Mesa Brewing Company — 76-year-old bluesman Robert “Bilbo” Walker from Clarksdale, Mississippi. cover photo © Marie Planeille.